Getting There: Depending on your U.S. departing city, airlines to Paris or Marseilles International Airports include Air France, American, Delta, KLM, Lufthansa, SAS, Sabena, Swissair, and United Airlines. The 1-800 phone numbers and Web links for these airlines are available at this magazines Airlines page. Avignon is a day's drive from Paris, but less than 90 minutes from Marseilles. The 1-800 phone numbers and Web links for international auto rental companies with cars available in France are available at this magazine's Autos page. It is strongly recommended to book in advance to receive the best pricing. With the broad array of information available on the Internet, it is relatively straight forward to find bed and breakfast (chambres d'hotes) or hotel rooms in Provence's towns or in the countryside. 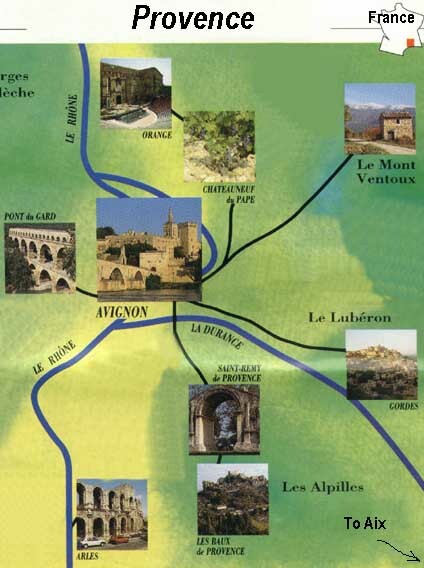 For example, we stayed at a wonderful inn in the countryside on Ile de la Barthelasse, in the middle of the Rhone River, across from Avignon, only 10 minutes drive from the center of Avignon (Ferme Jamet). In Aix, we stayed at a central hotel, Grand Hotel Negre Coste, on Cours Mirabeau. It had reasonable pricing and an excellent location for feeling the pulse of Aix. See the WWW links below for other lodging ideas, as well as general information on Provence. We utilized to good advantage a number of useful guide books for our stay in Provence, including Rick Steve's France and Frommer's France. A fun book recounting the experience of a new settler in Provence, Peter Mayle's A Year in Provence, makes good reading. Other travel books on France and Europe are also available in the Travel Book Store.